Setting up for our panel discussion this Thursday night, the Seattle Times asked each of their panelists to answer some canned questions about the future of transportation. The result is here. I hope the contrasts will motivate you to come! Bravo to Bryan Mistele of INRIX (the traffic consultants to the notorious TTI Urban Mobility Report) for being willing to come into the densest part of Seattle and announce that (a) cars are our future and (b) light rail is a bad investment because of its ridership in the early years. (Both claims presume the linearity of past trends and the irrelevance of land use changes in response to transit.) But the courage is admirable: To say these things in the middle of Seattle would be like me pitching high-intensity transit networks at the Elks Hall of a small town in Nebraska. Notice, as you read this, how all high-level discussions, at regional levels or above, tend to presume that there is some answer to the "transit vs cars" question that is the same everywhere. In fact, the answer is radically different in different places, based on known built-environment factors and local politics that tend to track closely with those factors. Some places are suited to cars and therefore defensive about cars. 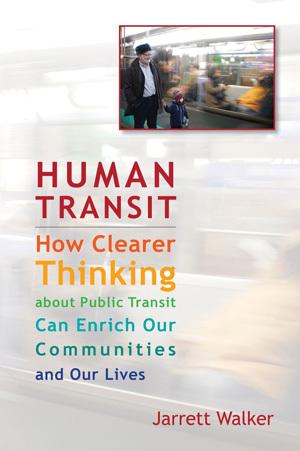 Some places function only with transit, so they view transit as an existential issue. All urban regions — and most states, provinces or countries — are going to have both kinds of places and everything in between. So my question going in is this: Why can't we let Seattle have the kind of transportation system it needs, and let low density and rural areas have the kind that they need? Why do the differing needs of different communities require that we have a war between those communities, at all levels of government? Good bloody questions. About two minutes ago, I just read a proposal for rural transit to have our interconnectivity. One concern those of us in suburban and exurban Puget Sound have is the opposition of Seattle legislators to us having our fair share of transit funding… especially as statewide highway funding already got a big boost without voter approval. More detail if you’d like. It is just so strange for a modern professional consultant, as Mr. Mistele claims himself to be, not to be aware and/or being that stubbornly ignorant of the complexity of relationships within and behind any urban transportation system. William, we are. It would be great if your proposal were possible, but Everett to Seattle has Sound Transit. For a long list of reasons, expanding Sound Transit to Skagit County or Bellingham will meet much resistance. Really looking forward to hearing the results of this discussion. I’m originally from Seattle (but no longer live there), I’m still very much invested in the transportation legislation made there, and I’m hoping that this discussion can show some of the obvious and serious flaws in the Times’ (and their cronies’) thinking. Good luck! I appreciate how your answers explain why a multimodal approach is important, as supposed to just naming what pieces of infrastructure. One thing that I like to tell transit-skeptical friends is: the fundamental advantage of transit is that transit becomes more efficient as it gets crowded, but highways become less efficient as they get crowded. I’ll see you on Thursday! I think this so-called war is just an example of modern argumentation. Just like any other high-profile issue, there are exactly two sides, and only one side can be allowed to win. Why can’t all areas have great transit, should be the question. Not at the expense of the car, but as a viable travel alternative? We are never going to solve the transportation problems, if we keep telling lower density and rural areas they can’t support transit. Koch Brothers (and other big-money lobbyists for oil) are the reason rural areas are demanding that cities do *not* get decent transportation. The thing is, cars — and trucks — work great in truly rural areas. The roads are empty and uncrowded. And since the farmers don’t work 9-5, there’s no rush hour. You can go fast. There’s usually a dense little village, which is small enough to walk everywhere, and then farmsteads spaced 1/4 mile — or more — apart from each other. You walk in town and drive to & from the farmsteads. People in actual rural areas get this. And they’re usually happy to let cities fund subways or whatever and they understand why they’re needed — unless they’re being brainwashed by talk radio paid for by the Koch Brothers. Suburbs and exurbs and people living in rural areas but WORKING in cities — there’s the problem right there. The one which generates all the commuting. This category includes some people who understand their situation (and want a commuter train) — but it also includes some people who want to *pretend* to be rural without actually *being* rural — and that self-delusion makes them easy marks for the BS being pushed by the likes of the Koch Brothers. In some states, rural legislators are willing to balance their highway money with urban transit money. But in other places, they’re not. In Tennessee, for example, the state legislature told Nashville that they could not build a BRT.